Llanwrtyd Wells claims to be the smallest town in Britain. It's also home to some of the country's weirdest sports events. Bog snorkelling anyone? Llanwrtyd in Powys, Mid-Wales, is officially the smallest town in Britain. With a population of 850, it's not the smallest settlement - there are much smaller villages and hamlets. What makes it a town is its ancient charter and its town council form of government. At one time, it was probably the market town for its region. Traditionally, places granted permission by the king or the local lords to hold regularly scheduled markets received charters which conferred town status on them. That allowed them to establish the market rules - keeping the peace, weights and measures, the size of market stalls, who cleaned up after the cows - and have a council to run things. Why Would I Be Interested in Such a Small Town? Located between the Cambrian Mountains and the Brecon Beacons National Park , it's also within 25 miles of the Elan Valley Estate, a certified International Dark Skies Park and one of the six darkest places in Britain. So it's a center for mountain biking, walking and climbing vacations as well as first class stargazing for amateur astronomers. But Llanwrtyd Wells is the sort of place where pub conversations turn into crazy ideas; crazy ideas turn into plans, and the next thing you know, the locals and visiting athletic sorts are setting up some very weird and wacky events. 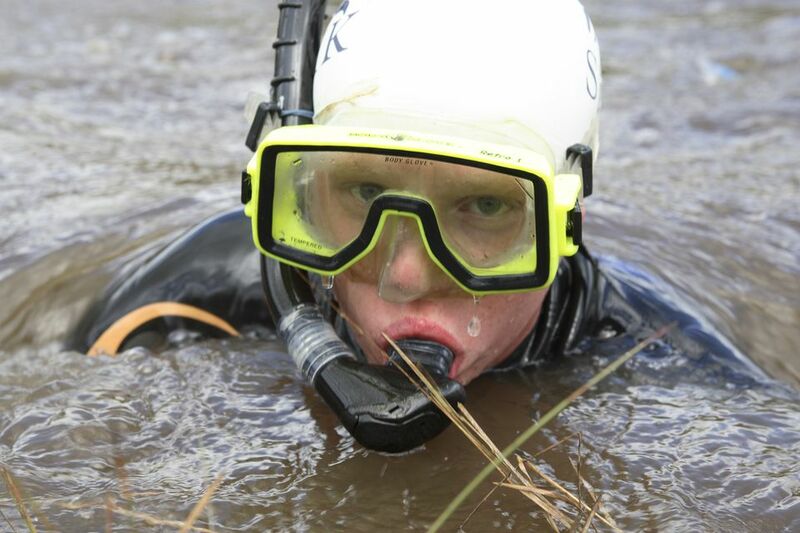 The World Bog Snorkelling Championship Next scheduled for August 25, 2019, it involves contestants in snorkel and flippers swimming back and forth the length of a 60 foot channel cut in the Waen Rhydd Bog, about a mile outside of town. Over 33 years, the event has grown from a small local event to a world championship with senior, junior, women's and international classes; contestants from all over the world and even the man from the Guinness Book of World Records in attendance. On the day, there's usually a bouncy castle or two and stalls selling food and drink. So if you're not keen on diving in, you can still enjoy a great day out watching a lot of other people do the breast stroke through a channel full of mud and reeds. If you're thinking of having a go, you can sign up for the event online. The Rude Health Bog Triathlon combines an eight mile run, followed by swimming the 60 foot length of the peat bog channel and finished with a 12-mile cycle race. It's next scheduled for 11am August 24, 2019. The Whole Earth Man vs. Horse Marathon was the first of the mad events that take place near Llanwrtyd Wells. They've been running it since 1980 and in 1982 they adjusted the course to try to make it a more even match between the man and the horse. It took 25 years, but a man did finally beat the horse by two minutes. There's a cash prize that grows every year the horse beats the man and, as of 2018, no man has won in 11 years. The prize for 2019 will be £3,000. The next competition is scheduled for June 8, 2019 and online entries open at 10a.m. January 5, 2019. This tiny town has more than its fair share of good pubs and restaurants. Among its highly regarded pubs, The Neuadd Arms, where the landlord first dreamed up the Man vs. Horse Marathon,has its own microbrewery. The Carlton Riverside restaurant is recommended by The Good Food Guide, the Michelin Guide and Automobile Association (AA). The local Tourist Office has more information about events, pubs, restaurants and places to stay. How do I say Llanwrtyd Wells? That Welsh "ll" is tricky but we're pleased to say that we've just learned how to say it. The opening "Ll" sounds a bit like "chy" if you think of the "ch" in the German word "Ich". The letter "w" in Welsh usually sounds like "u". So all together, Llanwrtyd is pronounced CHYAN' urr ted.